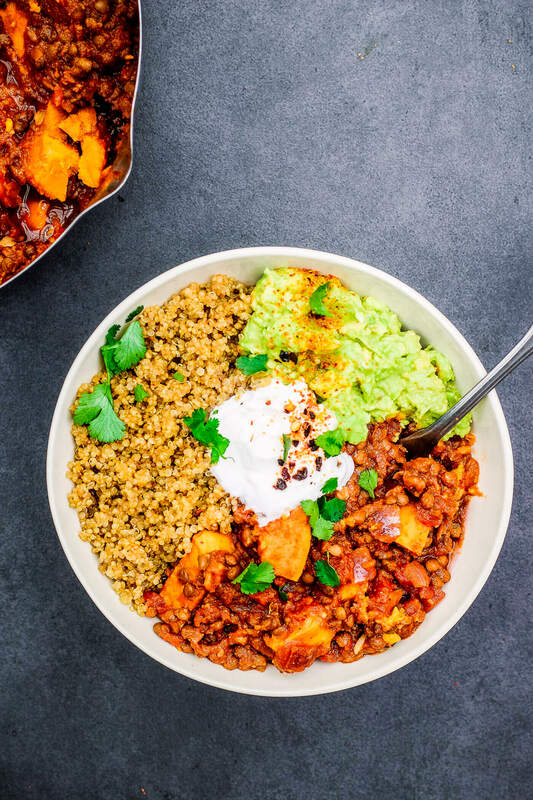 This lentil sweet potato chili is heaven when you need serious comfort. It’s perfect for reheating and freezing and is good no matter what the weather. The sweet potato gives it the best sweetness that’s amazing with all of the warming spices. 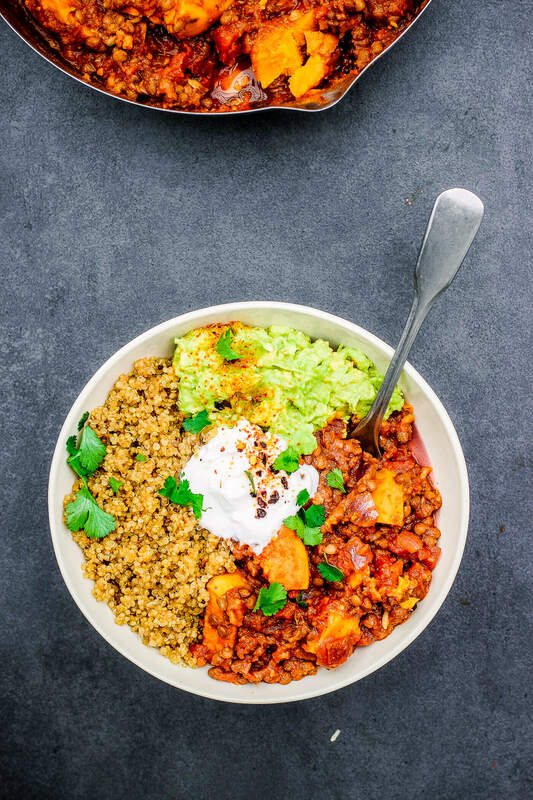 I have it with loads of guac, some quinoa and a good swirl of coconut yoghurt. Preheat the oven to 200’C. If using dried lentils, get these on to cook now- add them to a pot, cover them well with water or stock and simmer for about 25-30 minutes, until tender. Peel and chop the sweet potato into cubes. Lay it out on a roasting tray and sprinkle over 1/4 teaspoon of cinnamon. Drizzle with olive oil and sprinkle with salt. Roast for 25 minutes. While that’s roasting, add 2 tablespoons of olive oil to a large pot on medium heat. Add in the onion and garlic and cook for a few minutes until soft. Add in the spices, toss well and cook for another 2 minutes. Stir in the tomato paste. Drain and rinse the tinned lentils, or just drain your cooked lentils, and add them to the pot with the tinned tomatoes. Stir well and let it simmer gently until the sweet potatoes are ready. Add the sweet potatoes to the pot, season with salt and pepper and continue to let it simmer for another 5 minutes. If you’re using dried lentils (not tin) can you let me know the changes to the recipe? Thanks! Hi. You have 2 tins of lentils. Can I use dry lentils & if so how many grams? Thank you. No paprika only have smoked! Anything else I can substitute? Is it smoked paprika you’re using here? Greetings Indy, When you say green lentils, does this mean whole green lentils? Love your recipes. Thank you so much, . This looks amazing, relieved to see the recipe uses sweet potatoes and not butternut squash- I absolutely dread peeling them! Can’t wait to try this.